With President Trump facing low approval ratings, signs continue to point to a political wave against him in this year’s mid-term elections — and LGBT candidates are hoping to benefit. A record number of openly LGBT candidates are running for office, many in high-profile statewide races, which could result in a milestone election for a group that has been historically underrepresented. “We’re in this business because we think our candidates are going to do well in any election, but we don’t see just a Democratic surge, we actually see a progressive surge across the United States,” Parker said. Parker added, “we’re going to have more LGBT candidates than we have had ever in our history,” but also candidates who are women and people of color also stand to make historic wins. “Even though those candidates who aren’t from our community and wouldn’t be our endorsed candidates, I think they’re going to help carry the banner for us a little bit,” Parker said. Signs are strong that Democrats will pick up seats in 2018, which is consistent with the historical trend of the party in opposition to the party of the president gaining seats in the mid-term elections. A CNN poll published in December found 56 percent of respondents say they’ll most likely vote for a Democrat in the mid-term election compared to 38 percent who say they’ll vote Republican. According to CNN, that 18-point advantage is the biggest since the organization began polling on the 2018 election and the widest margin in two decades at this point in the election cycle. Democrats have their goals in sight. To win control of the House in 2018, Democrats needs 24 seats. To win control of the Senate, Democrats need just two thanks to the surprise victory of Sen. Doug Jones (D-Ala.) in the special election late last year. Part of the effort for Democrats to win control of Congress will be LGBT candidates seeking election to the House and Senate. In Wisconsin, Sen. Tammy Baldwin (D-Wis.), the only out lesbian in Congress, will seek to keep her seat in the Senate. According to the article, conservative groups have reported spending at least $3.1 million against Baldwin, which is more than what all the other Democratic Senate incumbents on the ballot this year have faced combined. But that only counts the reported money, not the dark money coming from groups that don’t have necessarily have to report their contributions to the Federal Election Commission. Nine groups have spent more than $4.7 million on ads that attack Baldwin or boost one of the Republicans seeking to unseat her, according to the article. Among the groups spending money against Baldwin is Americans for Prosperity, the Super PAC funded by the Koch brothers that has sought to unseat Democrats in Congress. According to the Huffington Post, Americans for Prosperity has spent $861,669 in the race. Meanwhile, Rep. Kyrsten Sinema (D-Ariz.) is running for the U.S. Senate seat in Arizona being vacated by retiring Sen. Jeff Flake (R-Ariz.). If Sinema is elected, she’d be the first openly bisexual person elected to the Senate. Sinema’s race could be interesting because a slew of right-wing candidates seeking the nomination could be her opponent in the general election. The newest entrant in the race is Joe Arpaio. President Trump pardoned the former Maricopa County sheriff last year after he faced jail time for unconstitutionally enforcing immigration law to target immigrant communities. 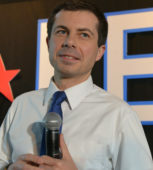 “Considering who’s on the Republican side of that race, it’s going to be a very clear pro-LGBTQ progressive candidate versus a right-wing ideologue, whichever one of them comes through,” Parker said. A number of non-incumbent LGBT candidates are also running in U.S. House races and seeking to take seats from Republican candidates. Non-incumbent candidates with good shots of winning are Lauren Baer, who’s running in Florida’s 18th congressional district; Angie Craig, who’s running in Minnesota’s second congressional district; Albuquerque City Councilor Pat Davis, who’s running in New Mexico’s first congressional district; Gina Ortiz Jones, who’s running in Texas’s 23rd congressional district; and Florida State Rep. David Richardson, who’s running in Florida’s 26th congressional district. Richardson is running for the seat currently occupied by Rep. Ileana Ros-Lehtinen (R-Fla.), who’s considered the most pro-LGBT Republican in Congress and announced she’d retire at the end of this year. Richardson’s prospects are strong in the heavily Democratic district that Ros-Lehtinen has maintained for years. Meanwhile, gay Reps. David Cicilline (D-R.I.), Sean Patrick Maloney (D-N.Y.), Mark Pocan (D-Wis.) and Mark Takano (D-Calif.) are seeking to keep their seats in the House and will likely prevail given their incumbent status, favorable districts and strength of Democrats in 2018. Other LGBT candidates could replace Democrats who are leaving their seats at the end of this year. In New Hampshire’s first congressional district, State Rep. Chris Pappas is seeking to claim the seat being vacated by retiring Rep. Carol Shea-Porter (D-N.H.). 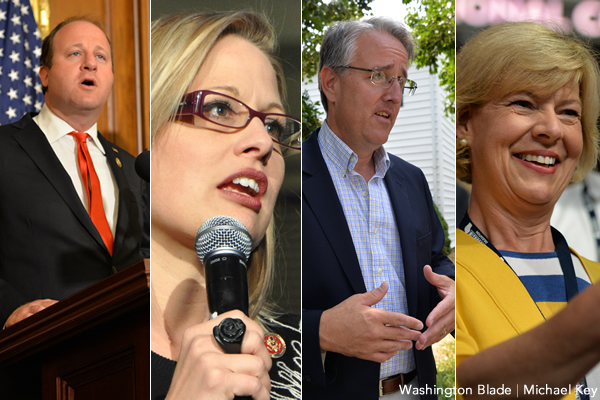 The race to replace retiring Rep. Niki Tsongas (D-Mass.) in Massachusetts’ 3rd congressional district is a veritable free-for-all of LGBT candidates. No fewer than 12 candidates are seeking the Democratic nomination, including three LGBT candidates. They’re Rufus Gifford, who’s gay and served as U.S. ambassador to Denmark in the Obama administration; Steve Kerrigan, who’s gay and ran to become Massachusetts lieutenant governor in 2014; and Alexandra Chandler, who’s transgender and a former Navy intelligence specialist. Other gay candidates are in uphill battles seeking to claim seats in Republican strongholds. Among them is John Duncan, a gay HIV/AIDS activist running in Texas’ sixth congressional district. Another candidate facing a challenge is Dan Canon, who’s straight, but fought as an attorney for marriage equality in Kentucky and is running in Indiana’s conservative ninth congressional district. If LGBT House and Senate candidates win each of these races, it could significantly shake up LGBT representation in Congress and potentially more than double the number of seven openly LGBT public officials currently serving. A victory for Chandler would make her the first openly transgender person elected to Congress. LGBT candidates are involved in other significant state races. At the top of the list are the gubernatorial campaigns of Rep. Jared Polis in Colorado and State Sen. Rich Madaleno in Maryland. Should either of them win, they’d claim the distinction of being the first openly gay people elected as governor in the United States. In Oregon, Gov. Kate Brown, who’s bisexual, is seeking re-election. In 2016, she already claimed the distinction of being the first openly LGBT person elected as governor. In Nevada, State Assembly member Nelson Araujo (D-Las Vegas) is running to become Nevada secretary of state. 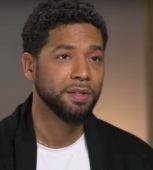 If he wins, he’ll become the first openly gay person of color to win statewide election anywhere in the United States. In the wake of major victories for transgender candidates in 2017, other transgender hopefuls, such as Chandler in Massachusetts, could see victories. In Maryland, transgender activist Dana Beyer is seeking Madaleno’s seat as he pursues the bid for governor and could be the first openly transgender candidate elected to a state Senate anywhere in the country. In Texas, the “blue” wave could result in the election of a record number of LGBT candidates running for office at various levels of state government. The Houston-based OutSmart Magazine reported 42 people are running for office in Texas, including two candidates for governor: former Dallas County Sheriff Lupe Valdez and Dallas businessperson Jeffrey Payne. Parker declined to identify her highest priority race for 2018, but said the Victory Fund’s “bread and butter is local races.” Also important, Parker said, are Baldwin and Sinema’s races for Senate seats and the gubernatorial elections with gay candidates. When analyzing candidates to support, however, Parker said the Victory Fund doesn’t take into account whether a year will be a Republican or Democratic wave. Great article. Let’s not forget state legislative races. Dems lost 958 state legislative seats during the Obama years and are practically an endangered species. LGBT millenials like Nick Autiello (Rhode Island) and Andrea Marra (New York) are making their first runs for public office and need our support too. On the plus side many Republicans are retiring or being defeated! The Fake POTUS’ endorsements have done nothing to help candidates, Bannon and others with their dirty money haven’t been able to sway elections either! Take NOTHING for granted of course which is what got us the mess in the WH now! MD can use Manning. Being ex-military, too, I’m sure “she” can relate to my current circumstances of being ignored for justice from the military (USN), Medical & financial benefits, and the MD Disability arena. Congressman Anthony G. Brown has flat-out ignored my letter(s). The fact that there are several LGBT democratic candidates looking to take a seat in Washington is amazing. Thank you for researching and sharing this information. I look forward to seeing what developments will come out of their individual campaigns.